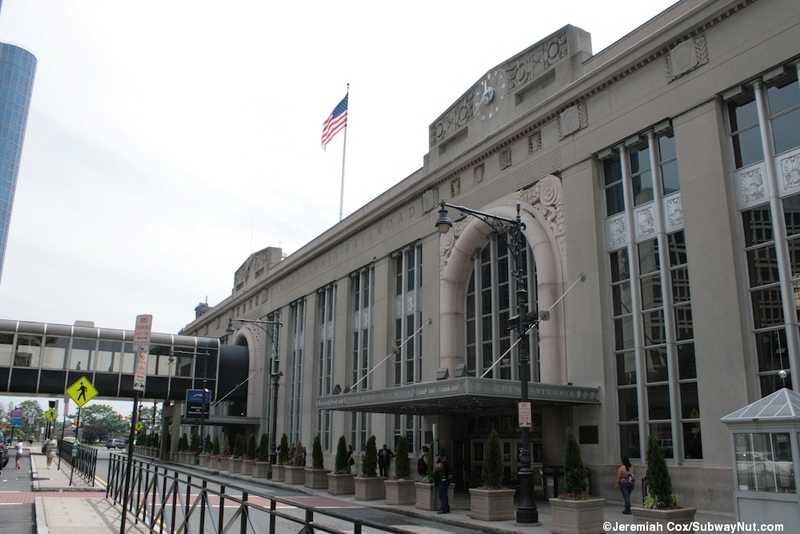 Newark's Pennsylvania Station opened between 1935 and 1937 as a project to consolidate transportation in Newark. 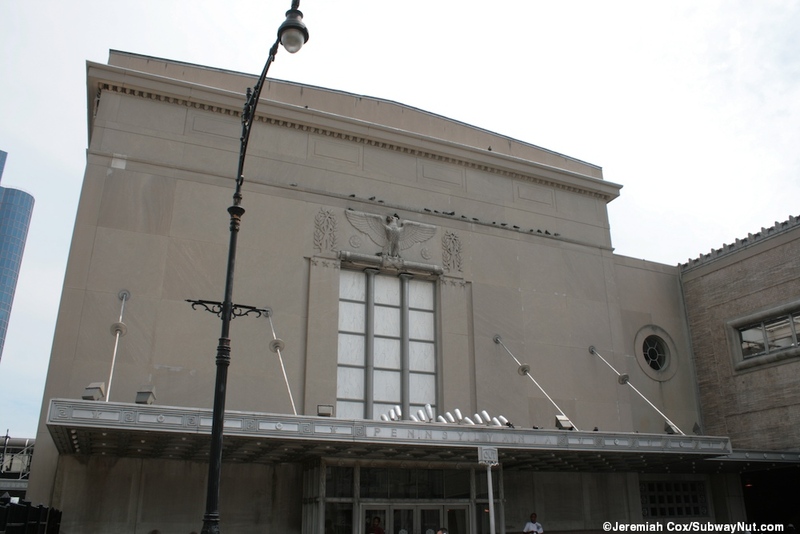 The station has a grand design of art deco and neoclassical and is on the National Register of historic places. 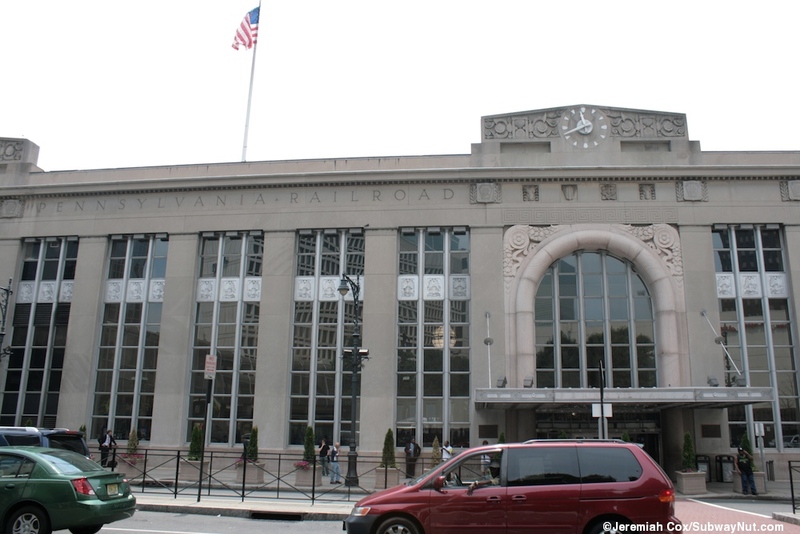 The station combined Pennsylvania Railroad trains, H&M (now called PATH) trains, these all stop on elevated tracks and platforms, and the terminus of the then new underground Newark City Subway used by trolleys. Trolleys (replaced with modern Light Rail vehicles in 2001) still operate from their underground terminal, the only portion of the station that is underground. 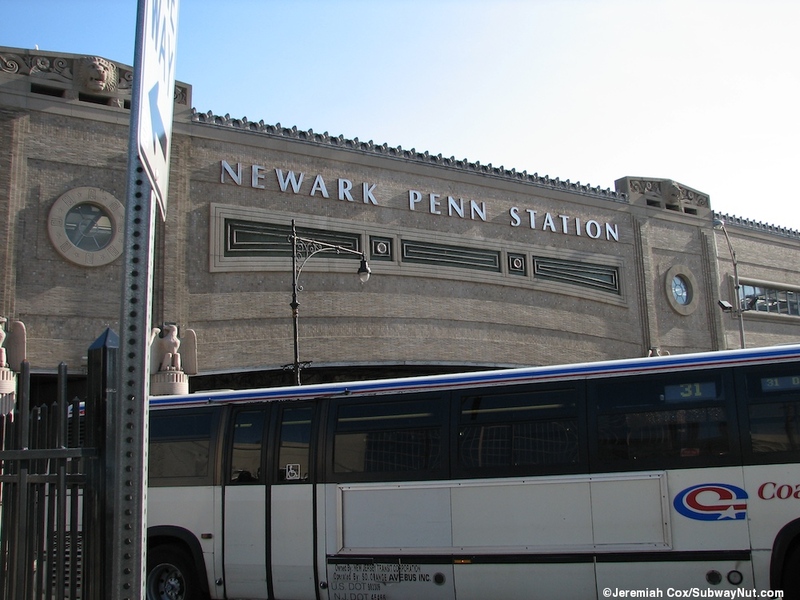 The stop is also a major hub for New Jersey Transit buses. 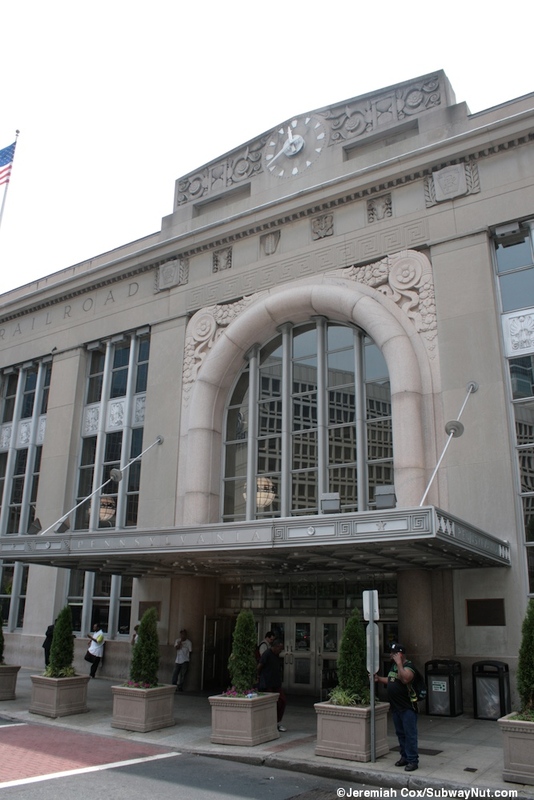 One separate wing off the main train station is also the Greyhound Station including its Bolt Bus Subsidiary to Washington, Baltimore, Philadelphia and Boston. 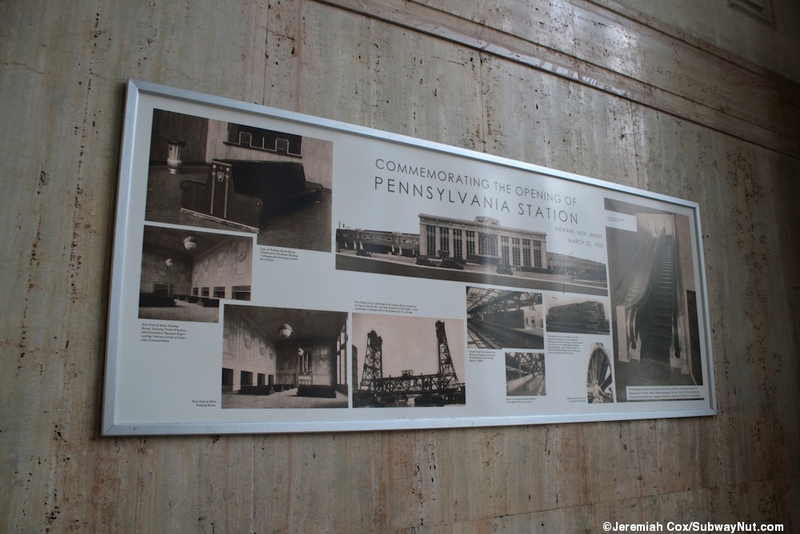 The station has its own distinctive signage system with black all capitals text between red lines that tries to compliment the original silver signs etched in the walls of the station. 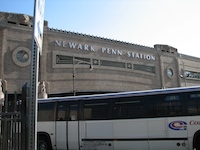 The exterior of the station, including the fully enclosed elevated platforms where they cross Market Street and Raymond Blvd are clad in either white marble or tiny mosaic tiles that resemble marble. 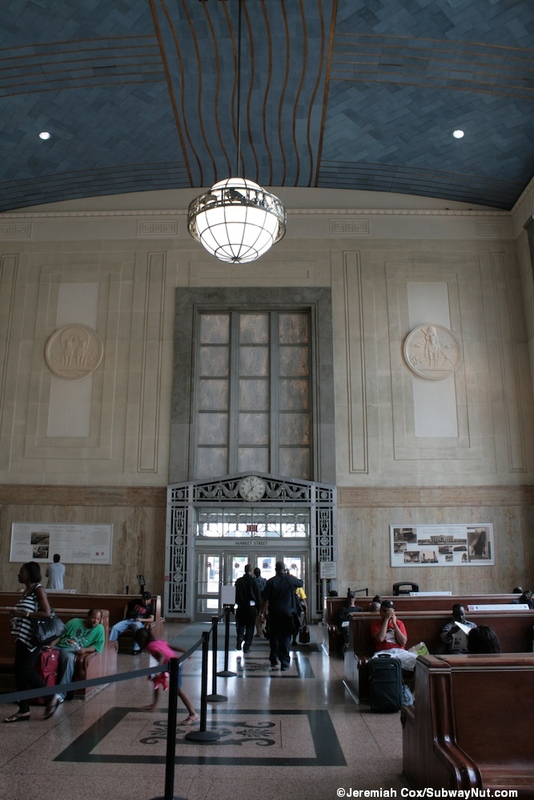 There is tons of decorative ornamentation that include medallions illustrating the history of transportation in the main waiting room and various other little pieces of ornamentation on the exteriors of the fully enclosed, mostly canopied (with gaps allowing natural light in and the steam and exhaust from steam/diesel locomotives out) and walled off platforms. A lot of this ornamentation is the logo of the Pennsylvania Railroad distinctively etched into many places. 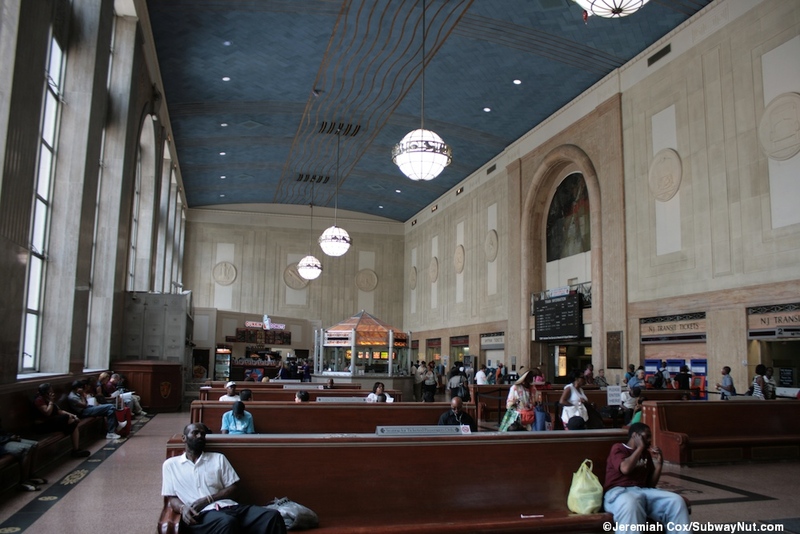 The best place to start a station tour is in the main grand waiting room. This waiting room is along the northwest side of the station, just northwest of the tracks along Raymond Plaza West. The area has separate lanes for through traffic and a passenger drop-off pull off that includes a taxi stand. 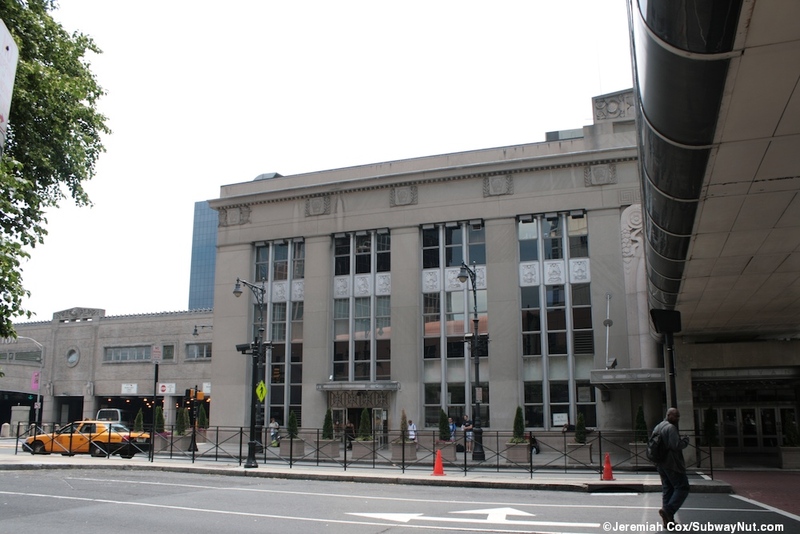 Entrances are from a plaza at the corner of Market Street and the main entrance from the drop-off loop. This main entrance has a grand silver awning beneath the glass that has the text for Pennsylvania illuminated at night. 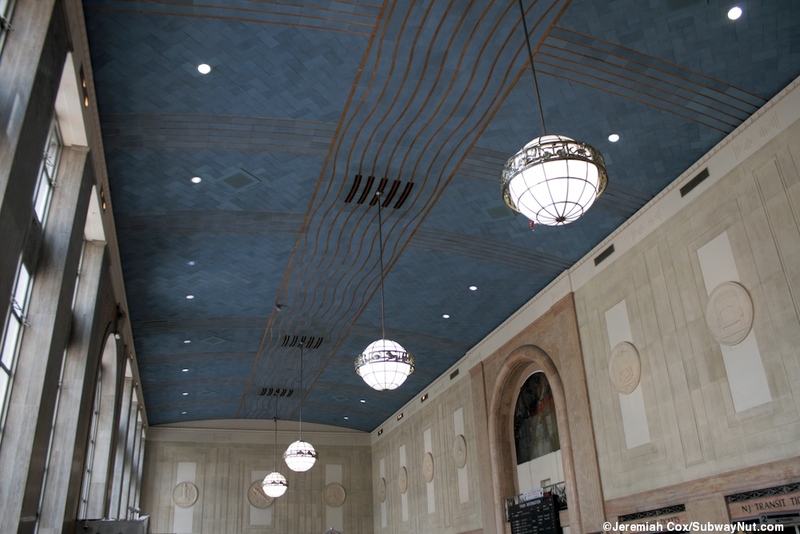 Inside the main waiting room is a grand, high cathedral ceiling with blue tiling and silver chandlers hanging down. Windows on the west side of the waiting room provide plenty of natural light. In the center are many wooden benches. Each of these benches is numbered and has the PRR logo etched in silver on each end. There is a sign above each bench saying 'Seating for Ticketed Passengers,' only as excuses to kick the homeless out. 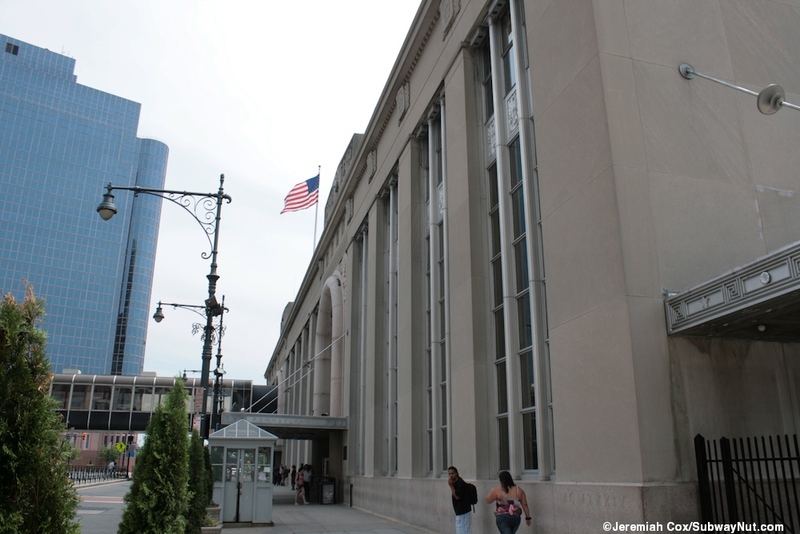 Two separate ticket offices, one for Amtrak and one for New Jersey Transit are along the south side of the waiting room. NJ Transit TVMs and Amtrak QuikTrak kiosks next to their respective ticket offices where more ticket windows once were. At the north end of the waiting room are a few concessions, a Ducken Donuts juts out from the south wall into the concourse and behind it, in the corner are two more. 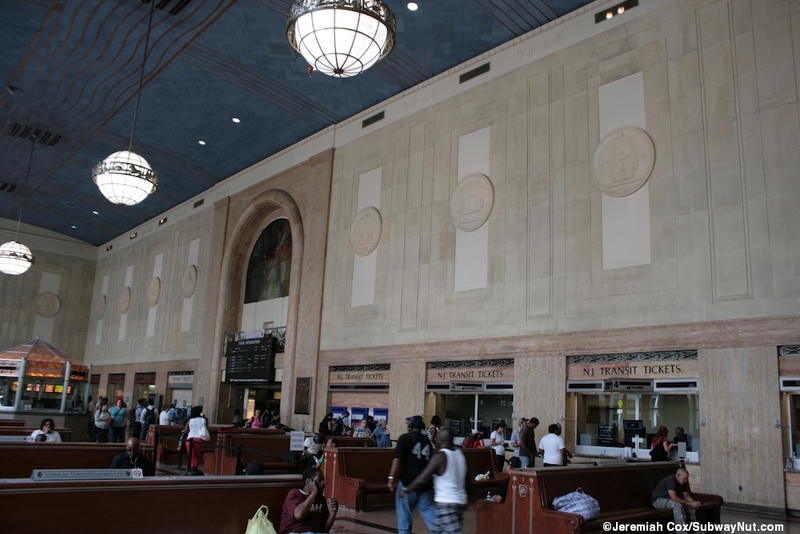 In the center of the waiting room across from the main entrance is an octagonal and orange glass roof information booth, staffed by New Jersey transit. On the south side of this information booth, beneath a tall arch is the main corridor that leads beneath the tracks and provides access to the platforms. Above this arch, at the entrance to the platforms is a slightly more modern Solari Flip board that lists the next 8 departures (along with the arrivals of terminating trains). This flip board and all television monitors throughout the station show both Amtrak with a yellow background, and New Jersey Transit with a background color relevant to the line trains. All train information displays in this station are completely integrated (unlike New York's Penn Station) so there is no need to find the right railroad's display. To reach the tracks passengers go beneath the Solari board and onto the Main Concourse lined with shops between the platform staircases. From the waiting room there on each side of the concourse is first a staircase and a staircase/up escalator (on the south side of the concourse) to the platform for track 5. 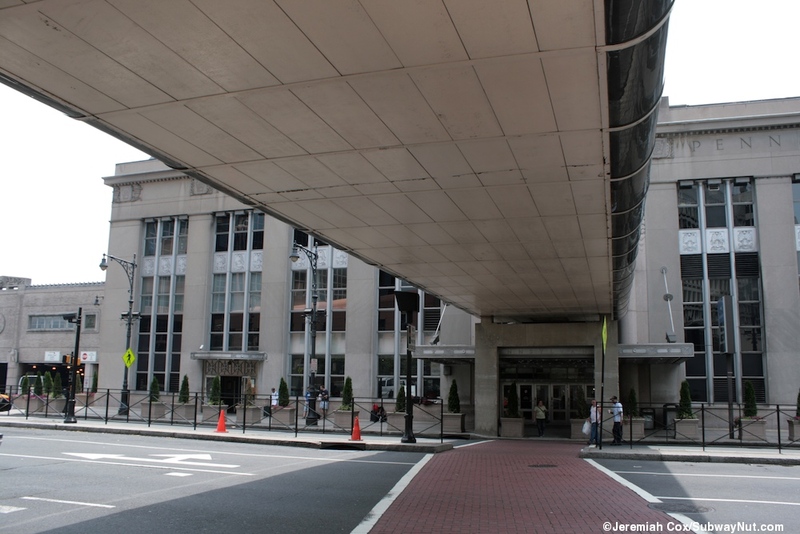 Next is a connecting walkway that leads to the left to the North Concourse and to the right to another station entrance to the Market Street Bus Lanes for those connecting buses. Continuing straight are two staircases (the southern ones also have up escalators) on each side to the platform for tracks 3 and 4, followed by track 2/PATH, next is the second connecting passageway to the North Concourse followed by a single staircase/escalator up to track 1/PATH. The passageway ends at two staircases up Track A. These are between the exit doors out to Raymond Plaza East and Market Street, a small corridor leads to the elevator up to Track A. The exit here has a similar grand silver awning and only leads to Market Street. 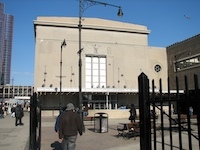 Here is also Raymond Plaza East which is the service side of the station. It prohibits through car traffic except for those going to a parking lot just south of the station. This is where the station's loading docks are and silver lettering above them says Baggage-Mail-Express, left over from the days when baggage and express service was a more important part of passenger trains. The other main corridor is the North Concourse. The eastern end begins with a staircase and elevator up to Track 1/PATH followed by the connecting passageway to the Main Corridor. 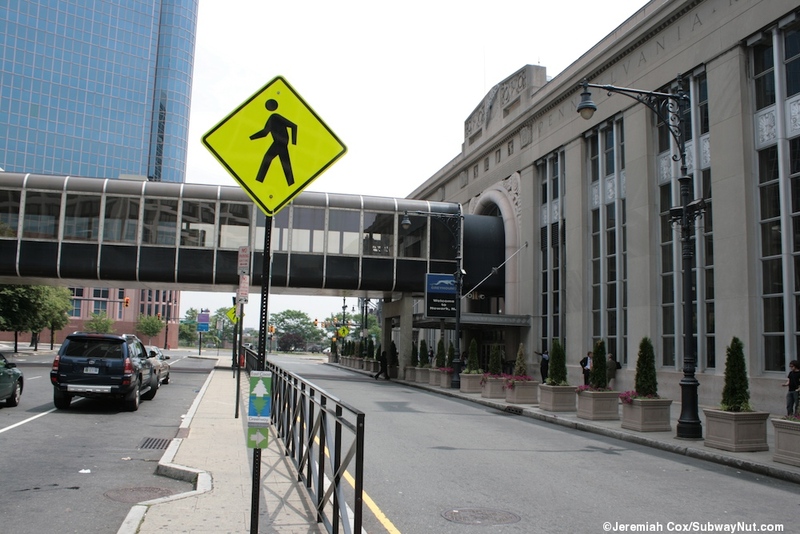 This connecting passageway (along the Raymond Plaza East Side) is where the Amtrak Checked Baggage & Package Express Office is. It is on the opposite side of the station from the ticket offices. Here are glass doors that look like your entering the store to reach the baggage counter and no real baggage claim area or carousel for claiming your baggage (I've never checked a bag to Newark and did try and watch an arriving long distance train passengers claim their baggage but it isn't clear where this is done except by just standing outside the baggage office). 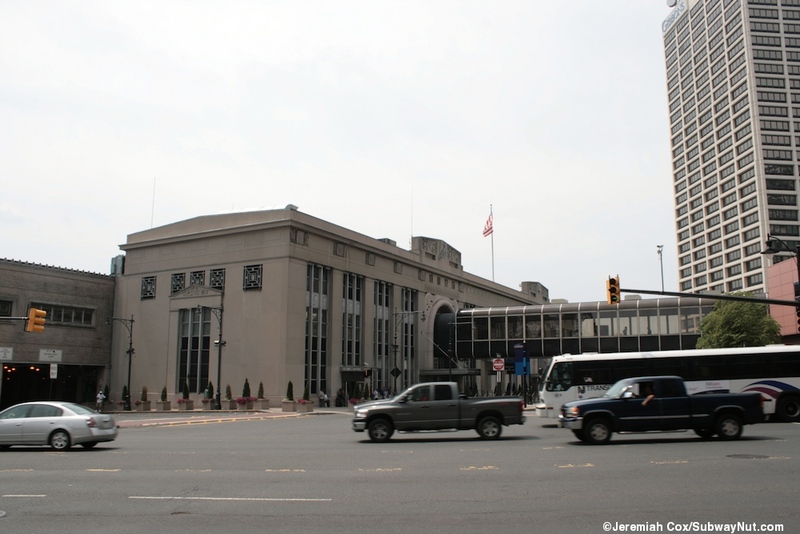 The center of the North Corridor has Police Stations for both New Jersey Transit and Amtrak, as well as Amtrak customer service, on the west side, but also a series of kiosk vender stands in the middle of it. It's less busy than the Main Corridor and the venders don't seem to get in the way of the circulation in the station. There are also non-passenger freight elevators up to most of the platforms from it (form Amtrak baggage service). Next is the elevator up to Track 2/PATH. This is followed by the main passageway to the exit to the four main Raymond Boulevard Bus Lanes. 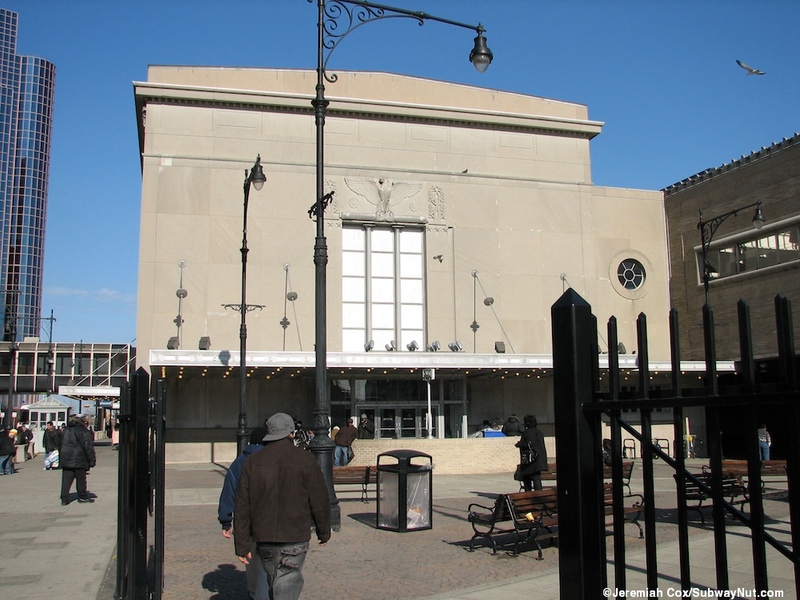 Along this passageway are glass automatic exit only doors that lead out from the escalators that run up only from the two Newark City Subway exit platforms (their platforms 4 and 5), and arrive in front of a mural of jazz players, The New Spirit Ensemble by Mel Clark. This passageway leads down about ten steps with a separate elevator to the bus lanes. The 4 Raymond Boulevard Bus lanes include various enclosed areas with actual doors (more than just bus shelters) for waiting bus passengers. After this exit is the elevator up to tracks 3 and 4. We then reach the northern end of the line of kiosks and an important access area. Here the second connecting concourse goes over to the main concourse. 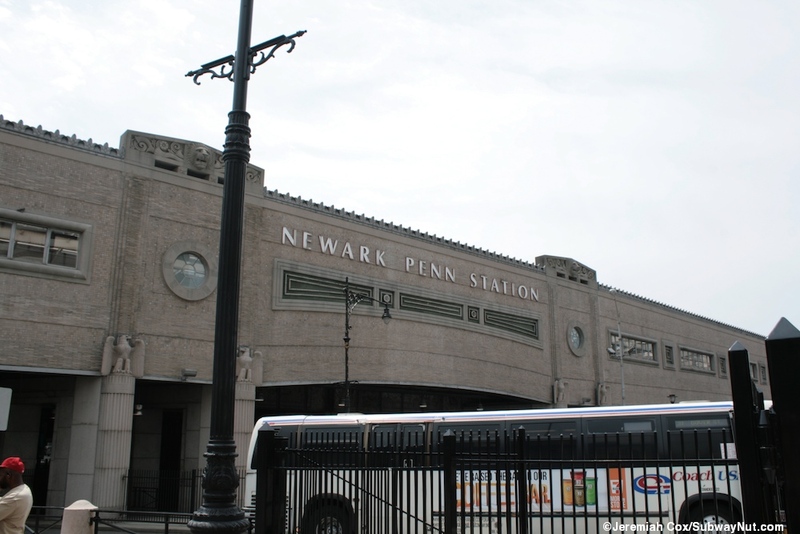 A staircase leads down to the entrance via staircases to the Newark City Subway station followed by its elevator separate from the staircase, another staircase leads up to track 5. There are then three escalators that lead up to the Gateway Concourse on the Upper Level. To round out what is at the end of the North Concourse is a corridor to doors into the small and cramped Greyhound ticket office and waiting area. The concourse ends at another set of doors that lead out to Raymond Plaza West, these doors have a similar grand silver awning but running just above the awning into the second level of the station is the modern glass skywalk that connects the station to the Gateway Center and via another connecting skywalk to the Legal Central. 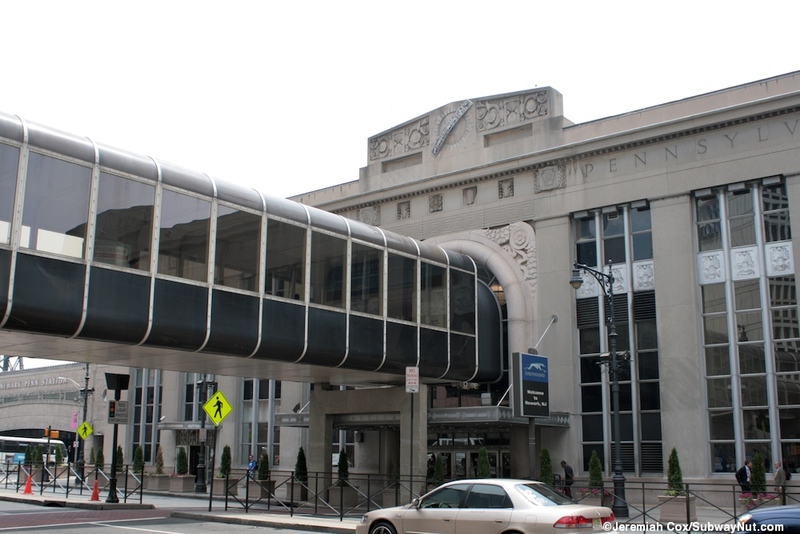 This Skywalk described above leads to the Gateway Center Concourse which is more of an intermediate landing than another concourse. It is at the same level as the main railroad tracks (except for exit platform for Track H, that serves terminating PATH trains on a third level basically in the roof of the station) and connects to two escalators down from the exit Track H and to the glass Skywalk across Raymond Plaza West to the Gateway Center and connecting to another Skywalk across Raymond Blvd to the Newark Legal Center. 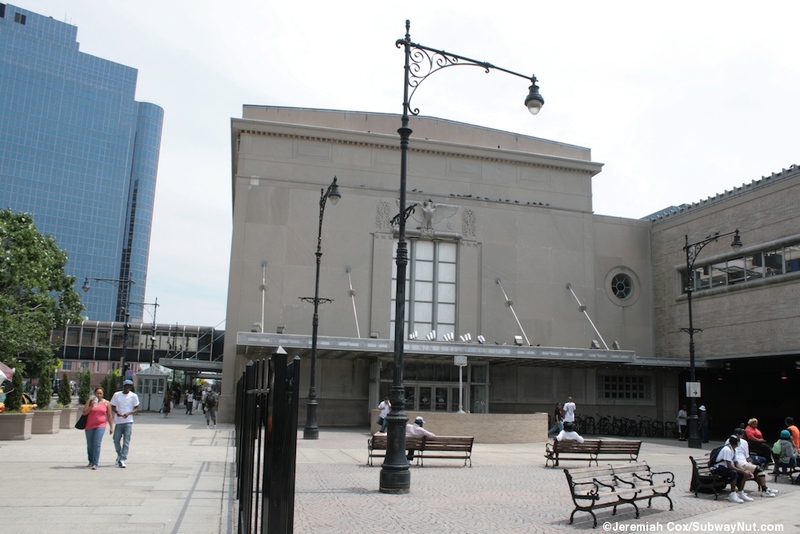 The Greyhound station is a cramped area with generic benches, a small ticket counter and its own less grand set of doors out to Raymond Plaza West almost directly at the bus loop. This door has a smaller curved silver awning above it that says Greyhound (where Pennsylvania is normally written). This station I believe has been used by Greyhound since the Station's opening. Greyhound lacks its own dedicated bus bays and buses simply stop outside the small waiting room. There are two more concourses that connect railroad and PATH passengers with the street, both feel much more modern, have limited hours (were probably not part of the original plans for the station) and the only way to get from these concourses to the main station is by walking along the station platforms. The more substantial one is the Raymond Boulevard Concourse at the northeastern end of the station, just before the station ends at the Dock Bridge. It is open Monday to Friday (from about 6am to 8pm only) and was (at least last renovated around 1999, or built new). 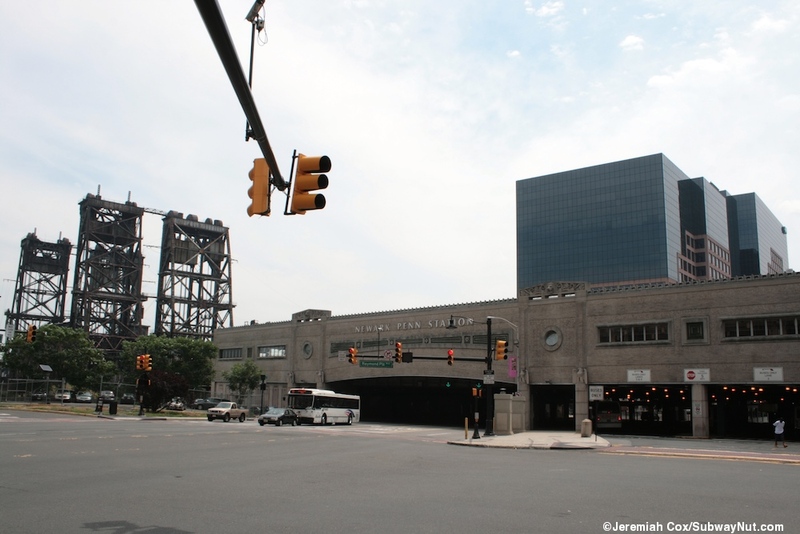 This concourse has just two entrances, one is at the southern, eastern end where Raymond Blvd East curves and becomes Commercial Street leading to a parking lot on the Passaic River. The other is towards its northern end where doors lead out beneath the train tracks to the north side of Raymond Blvd. Inside the modern concourse are a few concessions areas and storefronts although many are closed. There are NJT TVMs and a departure monitors. An elevator (secondary to the main ones) leads up to each of the five platforms, tracks 5, and 4/3 have an up escalator and staircase. Tracks 2/PATH and 1/PATH get two narrow escalators one up and one down. Track A has a single escalator that was off when I visited the station. Track A is normally only used by discharging, terminating Raritan Valley Line trains. The final Market Street Concourse is at the opposite southern/western end of the platforms. It isn't a connected concourse but simply a single staircase that leads down from each platform to separate glass doors to the west side of Market Street. Each of the tracks is labeled from the sidewalk. There are next train departure monitors directly above the sidewalk and displays list the station stops of the next trains at the entrance to each track. There is a small Bus Waiting Area (as it is labeled similarly to the platforms) between the staircases up to Tracks 1 and A. This concourse has extremely confusing weekday rush hour only hours (approximately 6am to 9am and 4pm to 8pm, closed by 9:30am), for passengers entering the platforms but the doors are always open for exiting. These hours aren't posted before going down a staircase to exit the platforms, leading to frustration (your webmaster once) trying to open locked doors to get back up a platform when changing trains and being forced to cross Market Street.